Our friends at Evil Mad Scientist Laboratories presented me with an awesome surprise gift this year at Maker Faire, a prototype of a Laughing Squid logo turned into a printed circuit board. As far as I know, this is the first time that anyone has taken our circuit board inspired logo and made a actual printed circuit board out of it. EMSL are thinking about producing these with a black background to match the logo and it’s possible they will be for sale in the future, as a drink coaster, etc. 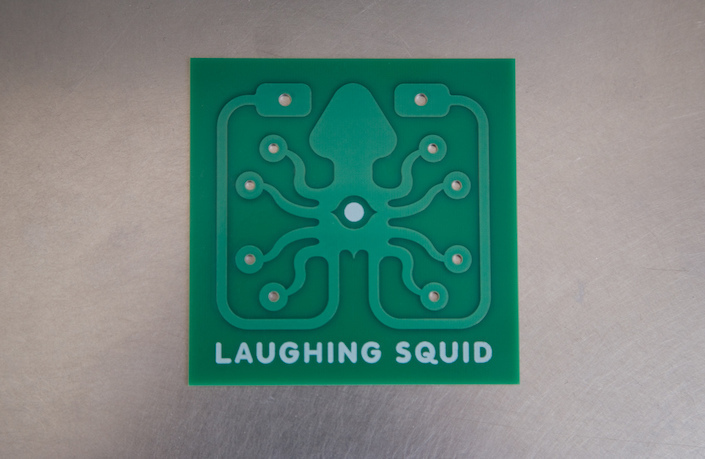 UPDATE: Here’s the EMSL’s write-up on the Laughing Squid PCB.